The example of Einstein; triune fitness; employability fixation; psychological fit; match-making; spiritual dimension. Thoughtful comments which every parent who wants his son or daughter to be an engineer, doctor or MBA disregarding his or her natural bent, has to ponder over. However, Einstein was a genius with a spontaneous intuition from his childhood day. But average folks like us need a more systematic approach for choosing the right career. What do we mean by the word “Career”. The Oxford dictionary defines the word as “profession or occupation with opportunities for advancement” and “progress through life”. The second meaning gives the clue to a broader definition of career. We may define career as the occupation or work which leads to professional as well as personal advancement in life and ultimately carries us safely and smoothly towards our evolutionary destiny. This bring us to the second question what do we mean by “right” career. Is there an occupation unique and taylor-made to my individuality? There are three aspects to the choice of a career, occupation or a work; first is the skill or knowledge-fit; second is the temperament-fit; third is a deeper spiritual factor which goes beyond skill, knowledge and temperament. The first factor is the skill-fit. Obviously to perform a work effectively, especially a professional work, we must have the knowledge, competence and skill in that domain of action. The present trend among youth is to acquire the knowledge and skill which is most sought after in the corporate world and therefore pays well or provides you with an assured career like for example, engineering, technology, medicine, management or chartered accountancy. In other words, the main trend among modern youth in choosing their career is employability. But any one with a little bit of psychological knowledge or insight knows that employability cannot be the sole criterion for choosing our occupation. Since time immemorial wiseman and psychologists have always emphasized on psychological compatibility between the work and the personality or the inner nature of the individual as the most effective and reliable basis for an efficient, creative and satisfying work. We may have the most sought-after or employable skill or knowledge but if we do not have the psychological qualities or temperament needed for that particular occupation, we will be a misfit in the job. For example, if I want to join the defence forces and become a military officer, a mere knowledge or skill in wielding weapons or a strong patriotic sentiment, though helpful or desirable, is not enough to make a good military officer. I must have the psychological qualities of the warrior-temperament like courage, endurance. A young man who is a shooting champion and with an intense patriotic fervour joined the defence forces as an officer. But when he was put in the battle-front, he collapsed when he saw one of his comrades shot in the neck and the blood gushing out from his mouth! We may think that the psychological factor does not matter much in specialized technical jobs. But this is not always true. A young engineering student who was very much interested in doing his postgraduate studies in biotechnology, sought the guidance and advice of one of his relatives who is a top biotechnology professional in US. He wrote to the young man something like this: think twice before you make the choice. Most of the good and available jobs in bio-technology are research-oriented, which require the temperament of a research scientist rather than that of a traditional engineer or technocrat. If you have this research-aptitude then go for bio-technology, otherwise leave it. Thus we can see that even in a specialized high-tech profession, the temperamental factors cannot be ignored. If a young student, who doesn’t have the research aptitude, but has the temperament and potential to become a top class professional in the conventional engineering discipline, enters into biotechnology lured by the glamour of high-tech, he will be a misfit in the job. The ancient Indian thought laid a very strong emphasis on this psychological compatibility. This Indian paradigm of work held the view that for outer efficiency as well as for inner growth, nature of the outer work has to be in harmony with the inner psychological temperament, qualities and capacities of the individual. According to this Indian perception every human being has four fundamental psychological faculties. One of them may dominate and determine the nature of the psychological temperament of the individual, called as swadharma in Indian thought. The first one is the faculty of knowledge, understanding, insight, intuition which make the scholar, thinker, teacher and the sage; second is the faculties of will and vital force which create the leader, warrior and explorer, adventurer and the man of power and large action; third are the faculties of mutuality, harmonious relationship, pragmatic adaptation or organization which create the entrepreneur, manager and the professional; and finally, the fourth, are the faculties involved in material work, execution or craftsmanship. This classification provides a broad indication for understanding our individual swadharma. However we must keep in mind this swadharma is not the nature of our surface personality. According to Indian psychology there are two layers of personality in an individual: first is the psycho-physical personality at the surface formed around our body and the other is the psycho-spiritual personality which is something deeper, more inward and larger, not related to the body, closer to the spiritual sources of our being and carries the accumulated result of our past evolution. The swadharma is the nature of this deeper and inner being in us. So we should not make the mistake of equating our passing fancies, inclinations and attractions of the surface being as our true nature. Many motivational gurus counsel us to do what gives you “joy”. But if this “joy” is just a fervent excitement or attraction of the surface being, then it is not a true indication of our swadharma. Our surface vital nature likes novelty; it feels a sense of thrill, excitement and joy when it takes up an activity which is something new or different from the one it normally does or accustomed to. But this surface thrills should not be taken as an accurate or reliable indicator for choosing our career. We are now brought to the most practical aspect of the problem: how to find the right fit between our occupation and our true nature, swadharma. There are three methods: counseling, test and self-observation. The first method is to seek the guidance, counseling and advice of those who are more experienced, wiser and knowledgeable than us and ideally who know us well. This includes parents, teachers, psychologists, experienced or successful professionals, career counselors, and spiritually advanced people. The second method is the tests. If we approach a career counselor or a psychologist he or she may probably put us through an aptitude or psychometric tests which are now extensively used in the corporate world to find out the psychological-fit of the candidate for the job. For example, in a psychometric test questions have no wrong or right answer. If I try to bluff or fake the answers I may end up in a job for which I am not inwardly fit. These two methods are useful in understanding our nature but not enough. Ultimately the discovery of our deeper nature and the occupation which fits into it have to be found by the individual through a deep, objective and persistent self-observation, using the other two external methods as supportive aids. As we have said earlier, passing like, dislikes and preference or the thrills and excitement of our surface being are not part of our true and inner nature. To discover this deeper psychological temperament we have to detach our mind from these surface urges and impulses and learn to see and feel the inner impulsions which come from the deeper sources of our being. There are a few helpful indicators. The first indication is to see what are the activities which give a deep and tranquil joy. The second indication is the sense of wholeness and integration, which means the activity, engages my mind, heart and soul and my whole being. The third indication is the sense of meaning and inner fulfillment. The activity or work gives a sense of meaning and purpose to life and a feeling of inner fulfillment. All other motives like money, wealth, power, achievement, become secondary or rebundant. In this inner discovery the four human types which we have described earlier can be of great help in finding the activity which matches our inner temperament. If my inner urge or joy tends towards cognitive activities like study, contemplation, rational or scientific enquiry, philosophical or spiritual speculations, or in general, towards seeking, expression and sharing of knowledge, then the right outer occupation for me is that of a teacher, scholar, researcher, thinker, writer. Similarly, if my inner urge is towards adventure, exploration, tackling difficult and challenging assignments, motivating, directing and influencing people or fighting against injustice or oppression, then I have the right temperament to be a statesman, athlete, military general, field executive or social activist with the potential for top leadership positions in business, politics, government, industry or NGO’s. Or else, if my inner orientation is to build, create, organize, along with some of the leadership qualities which we have mentioned earlier, then I have the right temperament to become an entrepreneur. Or again if I find great interest and joy in understanding, repairing and assembling mechanisms, mechanical inventions or in efficient and productive utilization of resources, then I have the inner make up of a technocrat. If I have the natural and spontaneous urge for painting or crafts and I feel a deep joy and ecstasy in all that is beautiful and harmonious in life, nature or people then I have an inborn artist within me. If I have a compassionate heart with an active temperament turned towards selfless and dedicated service to the poor, oppressed and downtrodden then I have the inner nature of a social reformer. And finally there is something beyond the psychological-fit, something related to our spiritual destiny. The psychological question is how to find an occupation which is in harmony with my deeper and inner nature and which will lead to inner fulfillment as well as outer effectiveness? The spiritual question is what is my role in universal work? What is the Work or Mission which I alone can do and which will lead to my highest spiritual destiny or potential? This requires a psychological and spiritual discipline which was described in some detail in the Mother’s article “what is my role in universal work” published in this issue. 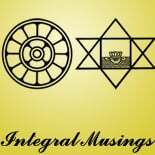 This entry was posted on February 6, 2013 by integralmusings in Harnessing the Human Potential.